On-Demand Hot and Cold Bottle-Free Water Coolers bring innovation for safer water with less hassle. The counter top version and free-standing version of this Premium Dispenser use new technology to eliminate the need for an open reservoir for cold water storage. Supply clean, fresh tasting water to everyone in your home or office. Great for stylish break rooms, small offices and wet bars. At only 16.5″ tall, this unit fits on counters under standard cabinets in homes and offices and can serve up to 30 people.The 2-temperature single dispensing faucet comes with a dual-button Hot-Water safety feature and no-touch dispensing faucet.The closed, pressurized dispense system admits no environmental contaminants and delivers a faster flow of water directly to your cup. The 10″ tall opening allows easy refill of large water bottles and mugs. This cooler with the most advanced features dispenses hot and cold water for offices up to 50 people. The stylish design fits into modern homes and offices. There is also extra storage below for cups, coffee or other sundries. The 10″ tall opening allows easy refull of large water bottles and mugs. Comes in attractive silver and gray. Eliminate the cost and inconvenience of bottle fed water coolers. No reason to clutter your hallways or closets with bottles of water. Built-in water filtration delivers clean, great tasting water without the need for unsightly water bottles. The closed system keeps environmental contaminants out, so there is no need for costly in-tank sanitization. 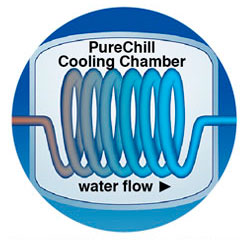 Water is chilled on demand when it passes through the cooling chamber to the faucet. An integrated Filter Monitor ensures freshly filtered water every time and the Auto Safety-Shut-Off Valve provides peace of mind. The sturdy cabinets have steel subframes and slide panels, ABS front and top covers, and a high impact appliance finish that is easy to clean and keep looking like new. Auto Safety-Shut-Off Valve provides peace of mind.